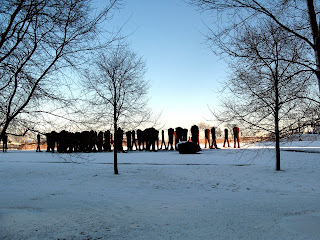 106 headless figures in the snow. They do look like they’re trudging across the tundra. No snow on their shoulders though. That’s what I’m waiting for. I promised you a shot of ‘Agora’ in the snow. Here’s the first one ever published, anywhere. It was a big blizzard we had here in the Midwest. Just kidding, I do have a photo. Soon as Blogger lets me upload it, it’s yours. You are currently browsing the archives for the winter category.